This frustration often referred to as “managerial lamentation” is common among leaders who need to make decisions in distinguishing the urgent from the inconsequential. Because there is much to do and choose from, it is particularly difficult for leaders to decide which is important and which is extraneous, and this affects the outcome of their expectations. 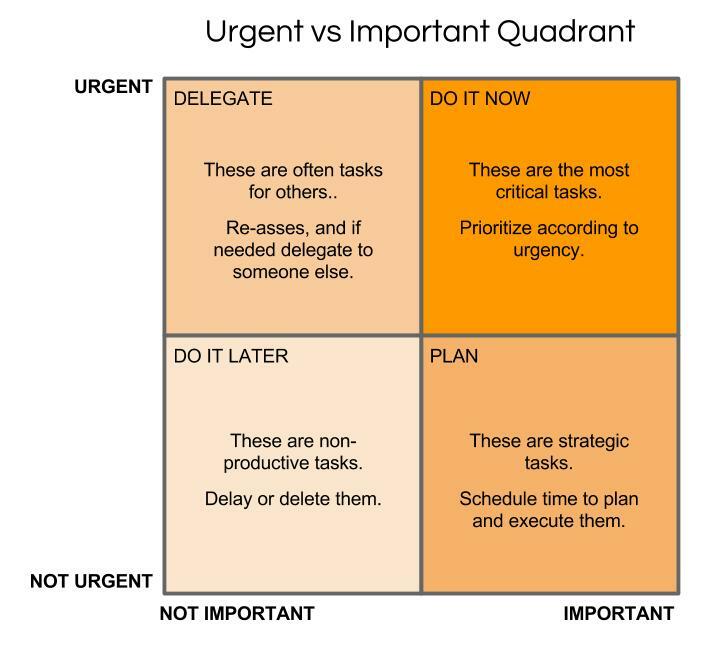 If an organisational manager is found in this disequilibrium state of decision-making, the quadrant analytical tool comes in handy. While quadrant analysis is discussed, applicable and used in spheres of human endeavour, the focus of this discourse is the decision-making process which managers undertake on a daily basis. Productive and unproductive efforts: This second strategy involves differentiating between productive and unproductive efforts. Spending longer hours in meetings does not equate to productivity, hence you must first determine if the meetings are necessary. If priorities are well set, you may discover that some of the meetings may not require your presence or should be timed as only relevant issues are tackled and conclusions are drawn. In this case, you may want to avoid meetings that may be regarded as unyielding when compared to priority scorecards. If you spend too much time reacting to events rather than making excellent use of your time to attend to issues that will aid the accomplishment of your short and long-term goals, then you may be caught up in the decision-making chaos and end up with half-baked decisions. If you define your agenda daily and follow up on them aggressively, you are laying a foundation for big strategic accomplishments. You can decide to use this strategy to keep yourself abreast of your progress rate in achieving set goals (both long and short-term). Effective delegation: Delegating effectively can help you reduce items on your priority list. It is often regarded as a sort of ‘learned helplessness’ where one delegates a task by being passively involved in the process. For instance, if a subordinate brings a problem to the board, instead of adding that to the list of priorities, the employee may be asked to go and draw up strategies that may alleviate such problem. If they can’t, then there may be a need to start to rethink the competency of such team member. This strategy helps you unload problems that you should have taken on yourself and also helps resolve the ambiguity that may arise as a result of taking a task that was started by others. Establishment of a plan/schedule: This involves setting boundaries and rigorously defending it by sticking to every item on the schedule. You may need to set aside time, at least half an hour each day for effectual planning. You may need to switch off all gadgets at this time, redirect calls to voicemail to allow for focus or leave your workspace to a secluded area to avoid any form of disturbance. If something is taking your time, you may need to retreat to answer few questions: “How important is today’s work to my goal achievement?”, “What is the best strategy to use for this task that will save time and reward productive efforts?”. You may also need to set limits that will help you keep up with schedules and execute them effectively and efficiently. Finally, think hard about the whole task and determine if your activities aid your goal attainment or whether you are part of the problem or part of the solution that beclouds your decision-making process. This will help you navigate actions to take to free yourself from conflicts that may arise from being faced with unambiguous situations that disguise themselves as important. Remember, you must understand which activity is urgent or not, do the urgent now or delegate it and do the unimportant later or delete it from your list of priorities. Every objective must be SMART and must contribute to moving the organisation to greater heights.